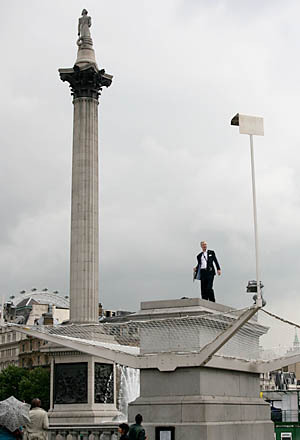 In July 2009, Briggensian and computer consultant Mike Holmes enjoyed an hour of fame as part of the One & Other Project, which for 100 days of the summer saw 2,400 individual UK residents transformed into art exhibits on the Fourth Plinth in Trafalgar Square. Here are some photos courtesy of Mike and his wife, along with some comments that Mike kindly sent in. The busiest part of the day was checking in before your allotted hour. On the south side of the square a Welcome Centre has been erected, and it is there that your are interviewed for an oral history project, photographed for a possible book, and asked to sign a multitude of disclaimers before you can be let on the plinth! 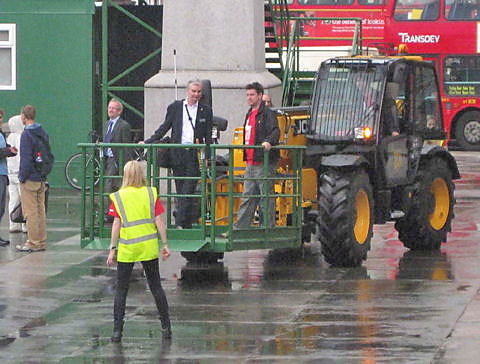 With the bureaucracy completed it was onto the converted cherry-picker (photo 1) and the slow journey across the square to the plinth itself. Thirty minutes earlier the heavens had opened so I went prepared with my umbrella in hand - fortunately I did not need to use it. Strangely my hour on the plinth was the most relaxing of the day (photo 2) - I chatted to the web audience, telling them about my favourite books, music, cinema etc. My enthusiasm for Lincoln where I live, the school where I am a governor and my local church community. 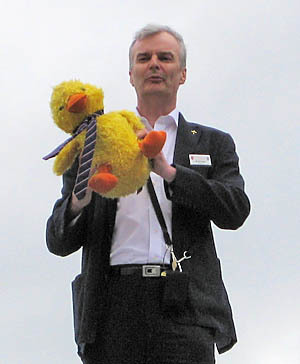 I introduced everyone to Daddy Doddy Duck from one of the local primary schools (photo 3) and enjoyed a cup of coffee and some custard cream biscuits. I finished with three minutes of silence allowing everyone to join me in giving thanks and reflecting on the amazing web of relationships we have in our lives, as Donne says "no man is an island".